WNYC Radio in New York is using the Google Maps API to share listeners' stories about economic activity in the New York City area. The stories are about jobs lost or found, stores opening or closing or good deals on rent, etc. Users can submit their stories to the map with an accompanying photograph or video. The stories are categorised on the map by 'bright spots', 'commerce' 'employment', 'housing', 'swindlers' or 'behaviour'. 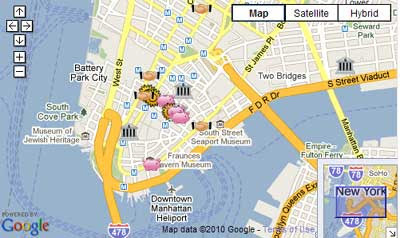 The map is a great way for WNYC to engage with their listeners and a great exercise in hyper-local citizen journalism. North Country Public Radio have created a Google Map to display the latest 20 stories from the NCPR Newsroom. If you click on the map marker of a story you can read an excerpt and the information window includes a link to the full story. The Toronto Star's Map of the Week column takes a regular look at issues affecting the city using the Google Maps API. This map looks at Ontario's adoption disclosure registry, mapping birth parents and adoptees by postal code, as a rate per 1,000 of population.